Below is a comparison of websites related to weather forecast for Barcelona. We've classified as if they hit or not, in their predictions. Meteorology is not an exact science, but in Spain there are rivalries between cities and this causes the weather forecasts are different from each other. The predictions from Madrid, tend to predict too much rain over Barcelona. 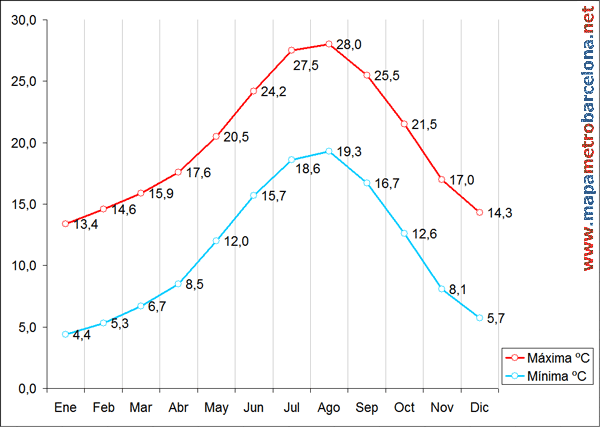 The predictions from the tourist office in Barcelona, ​​tend to predict too much sun. Although, in general, when the weather is changing, everyone is a disaster, and all fail a lot. At positions 8, 9 and 10 are the websites that tend to always put sun when rain is likely (Meteo Cat) or vice versa, websites that have a malicious forecast with two weeks straight of rain over Barcelona, in summer (July 2011) when in fact virtually not a drop fell (AEMET and Quetiempo). 2.- Meteorology as: Tiempo.com (A.K.A. Tiempo.meteored.com), forecast for 14 days. Reliability 87%. 3.- Meteorology as: ElTiempo.es, forecast 14 days. Reliability 83%. 4.- Meteorology as: Meteosat.com (or yr.no), forecast for 9 days. Reliability 77%. 5.- Meteorology as: Espanol.weather.com, difficult to navigate and offers a lot of useless information. Reliability 69%. 6.- Meteorology as: Meteo Cat, 8 day forecast. Probably use "Ja Oui" to forecast the weather. They tend to put too many "good time" when there is high possibility of rain. Reliability 68%. 7.- State Agency of Meteorology: Aemet.es, 6-day forecast. Probably used to predict weather a dice or maybe they read the coffee grounds. They tend to predict rain over Barcelona, when are practically impossible. Better not trust them. Reliability 65%. 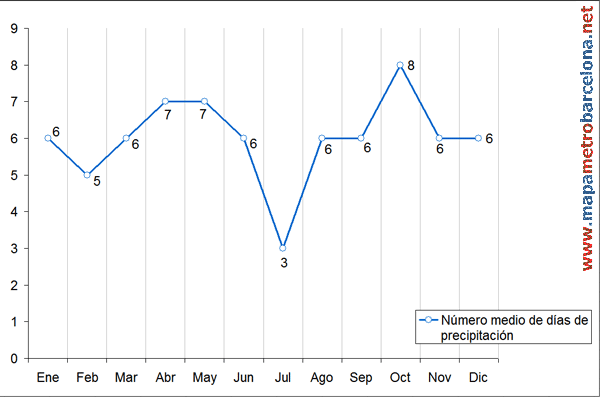 8.- Meteorology as: Quetiempo.es, forecast 10 days. The worst of all. Their data were obtained by AEMET, although sometimes differ (perhaps because they do not include last-minute corrections). Reliability 65%. 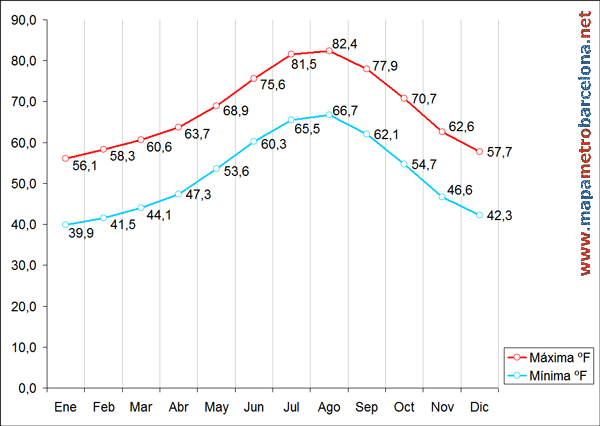 The following is from the official agency of meteorology in Spain (called AEMET) and shows the average temperature in Barcelona from 1970 to 2015. The above table indicates the temperature in degrees Celsius and the following table shows the same temperature in degrees Fahrenheit. 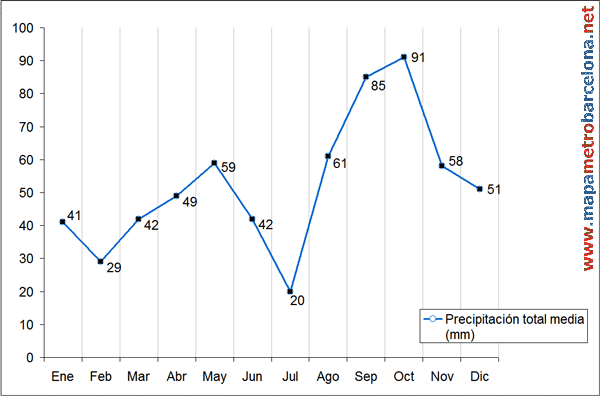 Annual average rainfall in Barcelona and a half days of rain per month. Same as above, the following data is the average Barcelona rain fall from 1970 through 2015. If you detect a failure or modification, or if you can help us to improve the translation, please send us a message and we will fix it. Thank you very much for your visit, we hope that was helpful sites on our list of Barcelona time.